The Secret DM: New on Kickstarter: Deluxe Tunnels & Trolls! 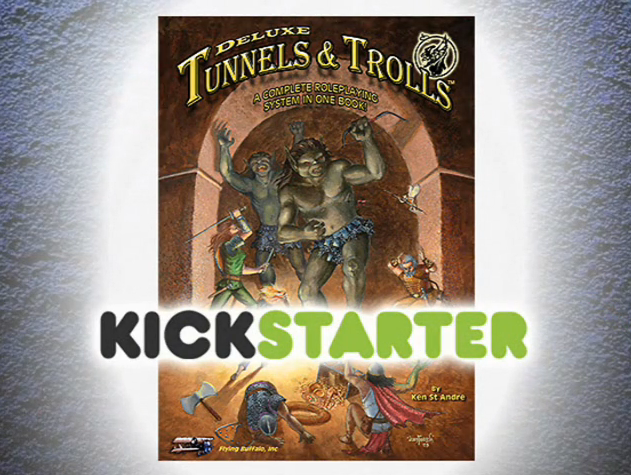 New on Kickstarter: Deluxe Tunnels & Trolls! One of the very first role playing games, Tunnels & Trolls, has a new edition in development, written by the game's original creator, +Ken St. Andre! You can support the project with a pledge on Kickstarter. If you aren't sure what Kickstarter is, read this. I've never played Tunnels & Trolls myself, but I've always been very interested in the game. To find out more about this project, I went right to source, asking Ken to shed some light on what this game is all about. 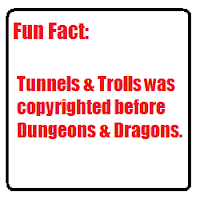 Tunnels & Trolls was the 2nd published role playing game, released in 1975, one year after Dungeons & Dragons was introduced. According to Ken, T&T developed out of his reactions to D&D; he thought D&D was a great idea, but he wanted something simpler. "Wisdom? What the hell is that? I'll take luck any day. Hit points? Why do I need hit points if I have Constitution -- that tells me how much damage a character can take." Other examples include saving throws that are based on the actual attributes, rather than an arbitrary target number on a d20. Ken also felt clunky mechanics like THAC0 (click here to learn what THAC0 is if you don't know that term) were stupid, and noted that "armor doesn't make anybody harder to hit...usually it makes a character bigger and easier to hit." So having armor makes you an easier target in T&T, but if that armor is doing its job, it's going to absorb damage before it gets through and kills your character. One of the major differences was magic. Dungeons & Dragons relies on Vancian magic (named for Jack Vance's Dying Earth series), but Ken felt it was simpler to just have wizards expend energy to cast spells they've learned. These changes and others would help Tunnels & Trolls separate itself from Dungeons & Dragons, and led to a strong and faithful following that continues to this day. 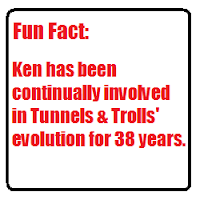 Since 1975, Tunnels & Trolls has been revised numerous times, and while one of those versions is unofficial and completely unrecognized by Ken and his design team, all of the other versions play very similarly, with only slight tweaks here and there to improve the game or add some new rules to clarify play. This is very different from Dungeons & Dragons, which has had many versions as well, although each edition tends to play very differently from the others. "Side A generates a hit point total. So does side B. This applies whether it's one person against one person or group on group. The lesser total is deducted from the greater and the losing side takes the damage, divided any way they choose." Ken added, "There are complications that can be introduced, such as using saving rolls in combat to accomplish various things. Hitting with a missile weapon requires a DEX saving roll, for example. But even if the missile doesn't hit, the weapons total for missiles is added into a general melee, as it is part of the effort." So if I'm understanding that correctly, even if your attack misses, that miss is factored into the total results, so your side of the conflict might still generate a success in that combat round, which sounds like an interesting way of keeping players engaged in each round of combat...even if their attack misses. "Saving rolls can be used with any attribute, or any Talent, and it truly counts on the character's ability to determine probability of success. There are no pluses on D20 rolls in T & T. Attribute + 2D6 roll (DARO--doubles add and roll over) plus character level number determines success or failure. Saving rolls may be of any level of difficulty, although I think I will discourage anything over 10th level. Lift a heavy boulder--saving roll on STR; sweet talk a tavern wench--saving roll on CHA; avoid catching the plague--saving roll on CON; hit a distant target with bow and arrow--saving roll on Marksmanship Talent." Warriors are better fighters than anybody. True warrior characters get an extra D6 for each of their levels added to their weapons total. Example, Cloyd the level 2 human warrior has an urukish scimitar worth 4D6 in combat. In his hands it is worth 6D6 because he is a L2 warrior. Garr Bajj, the uruk is a fierce fighter but is not a member of the warrior class. He has the same weapon, but it is only worth 4D6 in his hands. Human advantage: different kindred are mostly their own class as well as kindred. Only humans have the kind of society that produces dedicated warriors, wizards, and rogues. That is to say you can't have an elf wizard or warrior, just that you have to go out of your way as player to construct a back story that explains why he would get that class benefit when most elves wouldn't. I intend to break magic out by the kindred that uses it. Human magic is the standard for the game, but Elves will have their own subset of spells. So will dwarves, uruks, goblins, even ogres. Trolls don't. Trolls are magic, but don't use magic. There will be greater differentiation between the character types. Citizens and Specialists are important types of Trollworld characters. Players get more instruction on how to use saving rolls to their advantage. Gonna die in that uneven combat? Come up with a trick of some sort that a saving roll could account for, and possibly save that character. I've never personally played Tunnels & Trolls, although I've always been interested in the game. I have backed this kickstarter campaign though, so I'm looking forward to getting my copy of the deluxe edition and playing both the solo and the group versions. Because I haven't played though, I decided to reach out to the gaming community and get a perspective from people who actually play the game. +Erik Tenkar of Tenkar's Tavern and +Scott Malthouse of The Trollish Delver were both willing to share their stories. Scott: "To me T&T is one of the best games around for various reasons. I love the Discworld-esque humour that's inherent in the writing, Ken's chatty style, the saving roll system and the fact that you can play as a balrog (sorry, balrukh). "The thing about T&T is that it's so flexible, you don't feel restrained at all, players and GMs alike. It offered a much needed respite during a two-year long D&D 4e campaign we were playing at the time. It felt like an antidote to all the complexities that sometimes infuriated me with that system. "What I love most about T&T is the community because it's unlike anything you've ever seen. We've all got the personal email of Ken St Andre, the creator and we know we can hit him up anytime we want. He's always been, for me anyway, the integral part of the game and I'm glad he's stuck by the fan base in such an amazing way. Many fans are creators, like myself, releasing their own adventures into the wild." Erik: "I cut my teeth on AD&D at the age of 13 way back in 1980. It was (and still is) my “go to” game, a game I have run so many times it's probably part of my genetic code now. I can run it with minimal referencing of rules during play. There's only one other game I can run like that, and that's Tunnels & Trolls 5 / 5.5e. "My wife is not a gamer. I am, literally, the first gamer she had ever met. Yet she allowed me to run a T&T solo as a one on one adventure for her. Her first time playing any RPG and my first time running a T&T session. "You know what? It went better then either of us had expected. She had a blast and wanted to learn more about the system and I realized that T&T was amazingly easy to run as a DM. If you are going to run an RPG session for your non-gaming wife, you want the experience I had. Because once she had her first combat over with, she felt like she knew the game. "If I could only keep one game, it would be T&T. Why? "Because if I couldn't find a group to play with, I'd still have access to countless solos. Besides, my wife is willing to play it too ;)﻿"
http://bit.ly/Si6dXF (rpgnow.com) -- A link to a free copy of the T&T Quick Start rules! Hopefully this overview is helpful for you in deciding if Tunnels & Trolls is the right game. If this sounds like something you'd be interested in, I highly recommend heading over to Kickstarter and pledging whatever you can to support the cause. There are some really great reward packages available, and as the total pledge amount continues to go up, new stretch goals (or "milestones" as Ken refers to them) are being added. My thanks to +Ken St. Andre and the entire team behind Tunnels & Trolls, as well as +Erik Tenkar and +Scott Malthouse for taking the time to share their personal experiences. 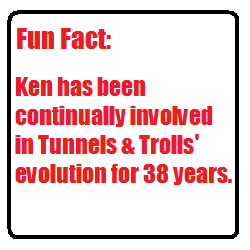 If you have any personal experiences with Tunnels & Trolls you'd like to share, I'd love to hear about them. Overall it sounds like a fun experience that's easy to pick up and play, and it offers both solo and group play, with a ton of resources and adventures available online.